The Academy of Business Mastery is the first business mentoring program of its kind, built from decades of experience transforming businesses and owners’ lives. It’s a natural extension of traditional business coaching, that far exceeds the results expensive business coaches achieve with businesses, and in far less time. If you’ve owned a company for five or more years, this training is perfect for you because its the collation of decades of mentoring of established businesses in hundreds of service and manufacturing industries. The structure of it will also save you hundreds of hours of work on your business time with its ready to use systems, procedures and measuring/management tools. That was found to be true after decades of listening to business owners wanting mentoring to grow their business. Only a very small percentage of businesses ever conquer these challenges. Most don’t and put up with the stress from their business for years. With just, short education on all aspects of growing a business you can put an end to stress, doubt or indecision with every aspect of growing your business. The Academy is just 8 months of time invested to conquer all your challenged permanently so you are free to enjoy your success and life. Imagine every problem you have now or in future, and every frustration – gone forever. That’s been the case with our open-minded business owner clients. Even cautious accounting firms have the given this program a big thumbs up endorsement, after experiencing it with their own business clients and seeing their profits increase fast. This client owned a direct sales service business which was stagnant at $1.5 Million revenue. The Academy identified why it was and during the training course the business grew to $10 Million revenue (for the financial year), while the net profit margin increased from 10% to 19% resulting in a substantial bottom-line improvement. Another client, a near bankrupt builder, grew from making a loss of $120,000 on a $1.4 Million revenue, to a net profit of $110,000 on a $2.8 Million revenue during the Academy of Business Mastery. It saved both his business and his assets. There are countless dozens of incredible results you can see by industry types when you receive the obligation free information on the Academy – from the button below. That’s just some of the content in the Academy of Business Mastery. The mentoring is 100% focused on achieving net profit margin increasing results. That’s the fastest and best way to increase cash in your bank. See some of the many impressive results here – that have been achieved with business owners, right from our very first Academy course in 2007. You’re probably unsure the Academy is right for your business, so let us answer all your questions about the suitability, potential results and contents of the Academy of Business Mastery. Book in for a “Breakthrough Meeting” to answer questions, to discuss your business and it’s growth potential. During the meeting exactly what strategies your business can benefit from will be identified and discussed so even if you don’t wish to proceed with the Academy you will be benefit from the meeting. Living the life you want, without stress is definitely possible from a simple decision and you can start on that path today. Saving the best until last, the best news is the Academy of Business Mastery is a lot more affordable than any good business coach with 5 or 10 years of experience. You pay as you go through the course too, so you aren’t ‘locked-in’ for the whole course, nor do you pay for it all up front as most courses require. The Academy is perfect for service and manufacturing business owner with 2 employees or more. See our other business courses if you have no employees or just have one as this isn’t one you are eligible for. 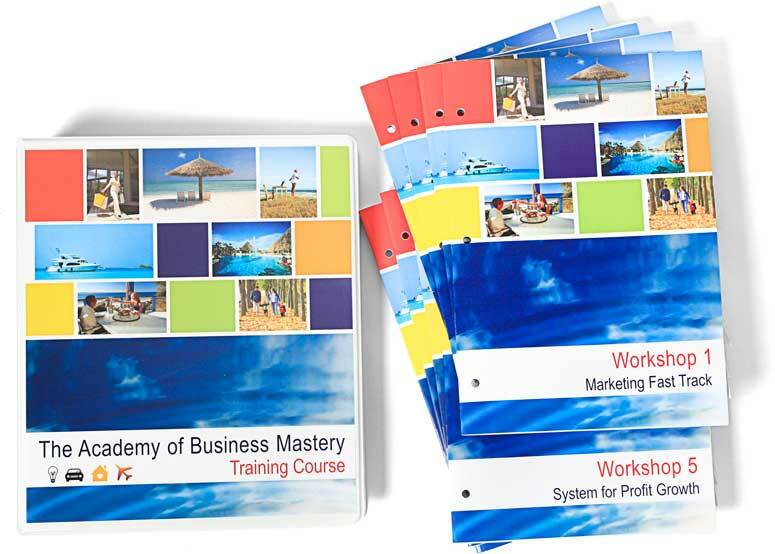 Find out more now – with the form below to receive a digital brochure of the program, “Contents of the Course List” – a list of all the digital, done-for-you systems and templates you receive that no other business course or business coach will provide. There’s no pressure on you to attend the Academy, in fact a lot of businesses aren’t eligible to attend and can’t. The best way to find out more, after receiving this information, is to have a friendly chat with Tim Stokes, your potential business mentor.